Black Israelites (1896- ), also known as Hebrew Israelites and similar names, are Black people who say they are descendants of the Israelites in the Bible. 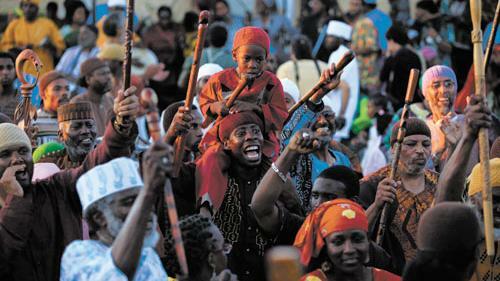 Most practise a Black American form of Judaism and account for maybe 10% to 20% of all Black Jewish people in the US. Rastafarians are an offshoot of the Black Israelites. They are best known, in the north-eastern US, for their street-corner preaching and calling people names. In fact, they made news across the US this week for calling some MAGA-hat-wearing boys from Covington Catholic High School names. But not all of them are like that. Note: I am not a Black Israelite – this post merely presents my current understanding of them. Location: They are found in at least the US, Canada, Jamaica, and Israel. Most are Black Americans, but that is not a requirement. Some try to convert Native Americans and Puerto Ricans, not just Blacks. You can even be White and be a Black Israelite! No hive mind: Like any Bible-based religion, they are split over disagreements about the Bible. Some do not eat pork, some do not even eat meat. Some believe Jesus was the Messiah, some that he was only a prophet. Some follow Orthodox Jewish practices, some mix in Pentecostalism or Black nationalism. Some follow Black supremacist teachings, most do not. Some are violent, most are not. House of Israel – the ones who called the MAGA-behatted names. They do it to everyone, even Black people. It is part of their communication strategy. Church of God and Saints of Christ – the oldest, founded by Prophet William S. Crowley, an Exoduster, in 1896. They own 400 acres in Virginia, a place called Canaan Land. African Hebrew Israelites of Jerusalem – 400 Blacks who who left the US in 1967 to settle in southern Israel (by way of Liberia) to found the Kingdom of God and to set an example for mankind. Not Back to Africa, but Back to Israel. They now number about 2,000. House of Yahweh – follows Yahweh Ben Yahweh as the Messiah. Were violent in the 1980s, killing people on his orders. God’s Chosen People: Black Israelites say that Black Americans match both the Bible’s description of the Israelites and its prophecies concerning them. European Jews certainly do not. Nor do Caucasian Arabs. The bad news is that after the Israelites fell away from God they lost their homeland and then, after winding up in West Africa, were singled out by God for punishment to be slaves in the Americas. The good news is that if they understand who they are and follow the Bible, not the fake White Christianity or Judaism they have been fed, they will rise from their suffering: “And the Lord shall make thee the head and not the tail” (Deuteronomy 28:13). Thanks to darqbeauty and v8driver for suggesting this post. How black was Ancient Egypt? The part that never makes sense to me is that the Africans who were taken from the continent and brought to America were from various different rival tribes. Members of one tribe would sell members of a conquered tribe and then members of that conquered tribe might turn around and sell people of the first tribe they would conquer in battle. This happened over and over again and involved dozens of different tribe across the western coast of Africa in what is today known as Senegal, Gambia, Guinea, Ghana, Togo, Benin, etc. To say they were people who “lost their homeland and then, after winding up in West Africa, were singled out by God for punishment to be slaves in the Americas” suggests they were one people or descendants of one people. This doesn’t even sound possible. I think the black Israelites in that Dimona, Israel image have nothing to do with the ones in the states spitting hate and blasemy 24/7. The white people currently getting all bent out of shape about the Black Israelites don’t seem to realize how much these beliefs parallel 19th-century white U.S. Christian conceptions of themselves as God’s Chosen People and the true inheritors of Israel. My cousin’s boyfriend is a Black Israelite, and nice as he is, he knows nothing about the history of the Hebrews, or historical information – period. I told him that studying past history of ALL or most of human culture would go a long way in trying to discuss being an Israelite, Black or otherwise. In the Bible there is actually quite a bit of Israelite infighting. In fact the story of how they got to Mizraim/Egypt involved Joseph being sold into slavery by his older brothers who were then forced to come to Egypt due to famine where they found him as a high official. Anyway, growing up in a Christian religion you were told who the Israelites were and they were never black. However, according to the accepted narrative Kemet was not founded by blacks either and I now know that to be untrue. So at this point I don’t assume anything merely based on what I’m accustomed to. What has interested me over time is not how religious stories are different but how they are similar. The main theme of the old testament is destruction and restoration of Israel via the Mashiach/anointed. The main theme of the new testament is destruction and restoration of the Christ/anointed. The main theme of Egypt’s Osiris myth is the destruction and restoration of Osiris via his son Horus. Take this synopsis of the Osiris myth from wikipedia. Osiris’s murderer, his brother Set, usurps his throne. Meanwhile, Osiris’s wife Isis restores her husband’s body, allowing him to posthumously conceive their son, Horus. The remainder of the story focuses on Horus, the product of the union of Isis and Osiris, who is at first a vulnerable child protected by his mother and then becomes Set’s rival for the throne. Their often violent conflict ends with Horus’s triumph, which restores Maat (cosmic and social order) to Egypt after Set’s unrighteous reign and completes the process of Osiris’s resurrection. And a great sign appeared in heaven: a woman clothed in the sun, with the moon under her feet and a crown of twelve stars on her head. She was pregnant and crying out in the pain and agony of giving birth. And she gave birth to a son, a male child, who will rule all the nations with an iron scepter. And her child was caught up to God and to His throne. The woman fled into the wilderness, where God had prepared a place for her to be nourished for 1,260 days. Now a man of the house of Levi married a Levite woman, and she conceived and gave birth to a son. When she saw that he was a beautiful child, she hid him for three months. But when she could no longer hide him, she got him a papyrus basket and coated it with tar and pitch. Then she placed the child in the basket and set it among the reeds along the bank of the Nile. And his sister stood at a distance to see what would happen to him. Once again, the child of promise born and hidden. The similarities strongly suggest a connection in which case the tradition that originated the symbols would have intended for them to be relevant to their culture. Yet, A lot of killing and purging of heretics helped establish the orthodoxy. Does our modern interpretation reflect what was intended? I’m open to that question being asked. I replied with a post about religious symbols and being OK with their interpretations being questioned despite being raised with one particular interpretation (I am no longer Christian). The blog behaved very strangely though, kicking me back to the main page after I hit submit and not showing my post, even in “moderation”. I can post again but I’ll wait to see if it will show up eventually. Same thing happened with the second attempt! If the posts are somewhere in the system please revive only one of them since they’re basically the same. Thanks. There is more to this than our people true know and mostly tarnished by many that say they are but are truly false prophets and imposters. It is called the walk and spiritual truth and not everyone affiliated with this crazy, psycho, and preaching hate. As with anything, do further research and reach out to those who truly know more about this as it really is. I found both comments in my trash bin. Not sure how they got there. I restored the first one to this thread (scroll up). I belong to the school of thought that the paid professionals of the US press do not need my help in demonizing Black people (or sanitizing White people). I tried to make it clear in the post that some Black Israelites are like that (or even worse) but most are not. I think, and I believe more of the followers of this blog have already noticed too, that we have a Black Israelite here among us! There is a record of the shipment of Africans to the Americas. Each ship is listed and has the port of departure and the arrival. if anyone can show how the Africans moved from the eastern part of North Africa (Egypt, Ethiopia Sudan) and the Middle East across the Sahara Desert to West Africa they would need to research African history. nothing in the Bible could account for such information. What we have is the big flood and Noah and Africa. There is a portion of Africa that is considered to be Semitic. Those people live North of the Sahara Desert or in Ethiopia and Sudan. Probably Nubia! They are not, I believe considered to be black in the true meaning of the term “black”. The majority of slaves brought to the Americas were brought from the Gold Coast or the south east side of Africa. It is nice to believe many different believes of our past; however it is probable that any individuals that were in the United States in 1865 were from Africa and were completely Southern African. People who came from the north of Africa were returned to their homeland. The Arabian trader brought the Muslim religion across the Sahara when they came to trade goods for slaves. Perhaps some of those who visited left their seed behind. I believe African blood is the oldest, the best and closest to the original man. I believe that Kenya continues to have the oldest bones known. Migration from Africa (evolution) has been the cause of changes in the makeup of mankind in different parts of the world. All other races are just changes caused by the environment and time. It would be nice if we could eliminate our “self hate” and be proud to be African based. When blacks perceive of themselves as black Israels they are being caught in a religious struggle and it is not a racial matter. History is written first and change by those who are alive! 1896? I had no idea they existed for that long, I thought it’d be closer to 1986. Thanks for this. The few I have witnessed in my city hurl insults at people and troll people on the commuter train. I am thankful they are not here in abundance verbally abusing folks just trying to go about their everyday business. @Origin Thank you for taking the time to share what you’ve written. I don’t have an issue with any of it and, like you, welcome the asking of all sorts of questions since there’s so much that doesn’t add up. I believe much has been lost in interpretation, as well as outright manipulation. None of that addresses my confusion, though. See, the Hebrew Israelites I know maintain that we come from a lost tribe that wandered and ended up in Africa. But at the time of our capture, we weren’t a single tribe living in one region. Our ancestors came from multiple different tribes living all up and down the western coast of the continent. I understand infighting, but this sounds like a stretch when you consider the whole war, capture, sell, reverse and repeat aspect of our African history. We come from one people in terms of being Black Africans, but we don’t come from one people when you consider culture, language, lineage and the like. So, which ones were Israelites? All of them? Some of them? Select members of each tribe? And does this then mean that the Africans still living in West African aren’t African, but are, in fact, Israelites themselves? The Hebrew Israelites I know also suggest we aren’t African. That we wandered to the continent’s western coast, but that we are actually Middle Eastern. I have family members who identify as Hebrews and, despite being able to trace our roots back to Africa (through more than just DNA results, but including these), they insist that we’re not African. I won’t lie and I mean no disrespect to anyone reading this, but I tend to dismiss much of what they preach because, out the gate, they deny Africa and our connection to it, which just doesn’t settle well with me. To me many of the BHI people in the states go through phases. There is a clear distinction between the Pan African Alliance (red, green and black) and BHI. The Israeli people are in it for their serenity with no excerpts of hate whether they receive it or not. A state side BHI more often than not finds themselves quitting and walking away. Do the research. Playing with religion via hate is a very self destructive path that can waste time one can never get back. Feeling hurt and angry should be channeled in a scientific manner that improves mental thus physciological health. Nothing is really proven with mythological religion. Don’t play with a no basis for anything. This song by Desmond Dekker came out in 1968. Even then some of the media were at pains to point out that the Israelites were not Israelis. tres apropos, she’s giving a lot of credence to something some B.I. said on youtube recently, something rather silly sounding about donald trump making the 3rd temple (ie of jerusalem), you know that part from revelations that sounds like it’s describing a nuclear explosion?